A hugely popular scholarship scheme, offering thirty members of the RAF's Junior Ranks an incredible opportunity to learn to fly, is now inviting applications for the 2019 cadre. 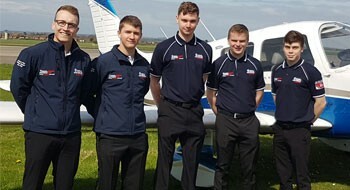 The scheme, which is funded by the RAF Charitable Trust and run by the RAF Flying Clubs' Association (RAFFCA), enables 30 Junior Ranks, aged under 25 from the serving RAF Regular and Reserve to undertake 15 hours' flying training on a light aircraft. They will also learn about Air Law, Meteorology and Navigation, that will help see them go from zero flight experience to flying an aircraft solo as pilot in command. Upon completion of the scholarship, candidates can also apply to the JRPSS Top-Up-Scheme which provides additional funding for a select number of applicants to continue their flying training and gain their Private Pilot's Licence. The JRPSS was first launched in 2014 to improve the air-mindedness of Junior Ranks by offering them flying experience and the opportunity to increase their knowledge and understanding of the technologies used in aviation. This year, which marked the RAF's centenary, the scheme celebrated its 100th Scholar, SAC Seb Ayling achieving solo flight. Seb said: "The JRPSS has been a life-changing experience for me - I cannot thank the RAF Charitable Trust enough. The feeling of being in the air is nothing like I have ever experienced and being the '100thSolo' in the RAF's centenary year was just the icing on the cake". The Trust's mission is to promote the Royal Air Force, support its people now and into the future and encourage air-mindedness and the aviation-related education of youth. Director of the Trust Justine Morton said: "The scheme is an initiative run by the RAFFCA that embodies our mission to get young people interested and involved in aviation. "The Trust recognises that although JRs operate in an environment surrounded by aviation, there is little opportunity for them to actually get into the air. Not only does the JRPSS provide them with the support they need to get airborne, but it also ignites desire and enthusiasm for personnel to learn more about aviation". Successful applicants will be notified in March, before shortly beginning their training at their nearest RAF flying club. Aaron Garcha, Head of Media for the JRPSS said: "As part of the Royal Air Force we are surrounded by some of the best that aviation has to offer. The JRPSS shows scholars what is possible, encourages them to go further and promotes a sense of achievement and pride in their abilities. "Thanks to the Trust, ordinary people are viewing the world from new heights and are achieving their dreams of becoming professional aircrew, aerobatic pilots, commissioned officers and adventurers. I recommend everyone to apply and take the next step in their aviation future". For full details about the Scheme and how to apply, visit www.jrfly.co.uk. Applications close on January 31, 2019.